Dorset County Council provides free transport for students in Years 7 – 11 to attend their catchment or nearest appropriate school and they live more than 3 miles shortest available walking distance from home to The Gryphon School. This is run by the School Passenger Transport Department which organises the routes and contract buses. It is possible for other students to apply for a spare seat on a contract bus operated by Dorset School Passenger Transport. There is an annual charge for spare/unallocated seats. Contact: Dorset School Passenger Service on 01305 224537. See also www.dorsetforyou.com where policies and application forms can be downloaded. From Sept 2016 the majority of students in Years 7-11 who live in the Milborne Port Area and receive free school transport provided by Somerset County Council (SCC) will no longer travel on Gryphon buses as SCC will be providing their own buses. More information will be sent out by SCC over the next few weeks and bus passes will be available for collection at school during September. If you need any further information please contact the school Bursary on 01935 811073 as we have details of which children will be travelling on the new SCC routes. Students in Years 7 – 11, who live within the catchment area of the school, may be entitled to receive free school transport – see above. Students who live in Dorset – Contact Dorset County Council School Transport Team on 01305 224537. Students who live in Somerset – Contact Somerset School Passenger Transport Service on 0300 123 2224. Students are not entitled to receive free transport to school when they join the Sixth Form. However, to help support Sixth Form students to get here, The Gryphon School contracts transport operating from a variety of locations. In addition, limited numbers of surplus seats are available on routes operated by South West Coaches on behalf of Dorset County Council. · Services/routes run by South West Coaches are detailed on the South West Coaches website – http://www.southwestcoaches.co.uk/school-services . 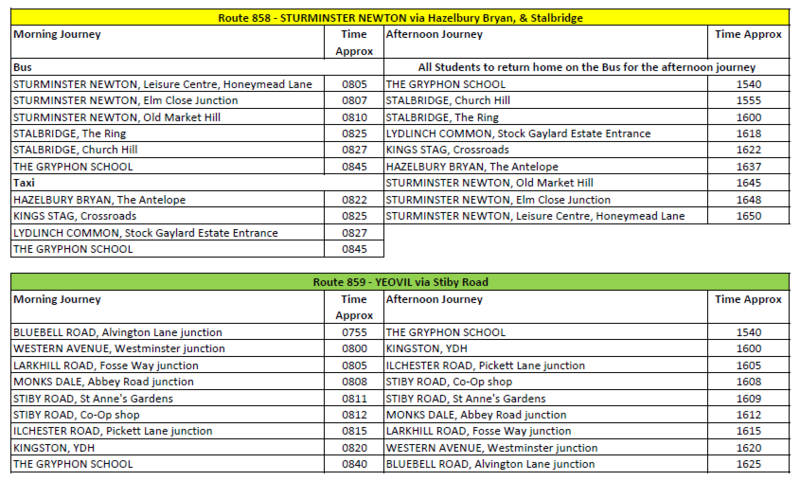 Applications for seats on these routes from Sixth form students must be made via South West Coaches, Surplus Seat Applications, 11 Oak Way, Lufton Business Park, Yeovil, BA22 8HS. These seats are offered on a limited and strictly first-come first-served basis. Application forms for the 2018/19 academic year will be available on the school website from Tuesday 19th June 2018. Students joining Year 7 will find WisePay information and logins in their induction pack. Question: What do I do if I miss my bus home? Answer: Go to reception and ask if you can contact your parents. Some availability for student car and motorbike parking, with a permit, exists on site. Parents who bring their children to and collect them from school by car must stop in the allocated drop off bays. The school has bike racks for security, although students will need to bring their own lock. The school has its own designated crossing patrol and students should choose this route when walking to school.